The architect of the Sloane Building, Thomas J. Bailey, was a man devoted to his work and his profession. He served as chief architect to the London School Board until it was abolished in 1904 and soon after took the same post at the Education Department of the London County Council. He was responsible for the design of many new schools across London during the Edwardian period, including the Sloane School. THE SLOANE BUILDING WAS BUILT IN 1908 IN AN ENGAGING EDWARDIAN STYLE, WITH A WEALTH OF LARGE FEATURE WINDOWS SET INTO THE BRICK FAÇADE TO ILLUMINATE THE INTERIORS WITHIN. 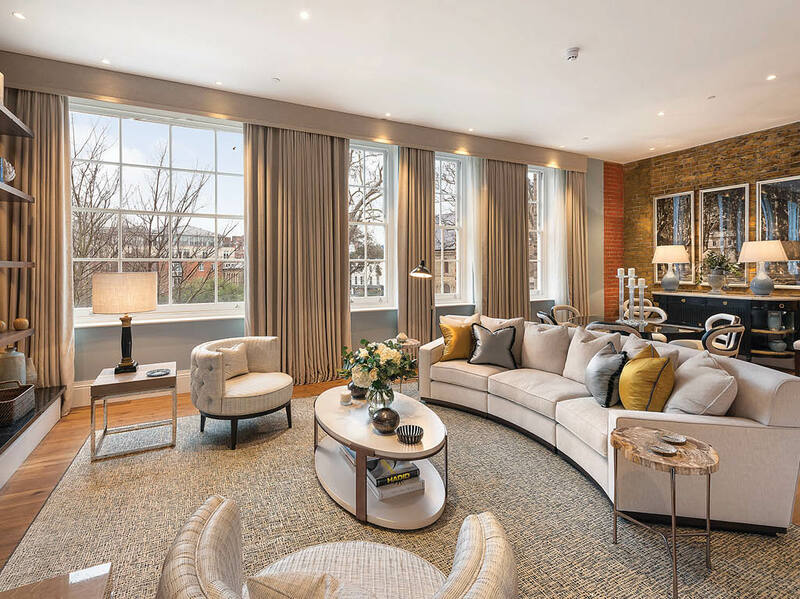 AN ELEGANT EDWARDIAN BUILDING ON CHELSEA’S HORTENSIA ROAD FORMS THE SETTING FOR A CURATED COLLECTION OF EIGHTEEN LUXURIOUS APARTMENTS. 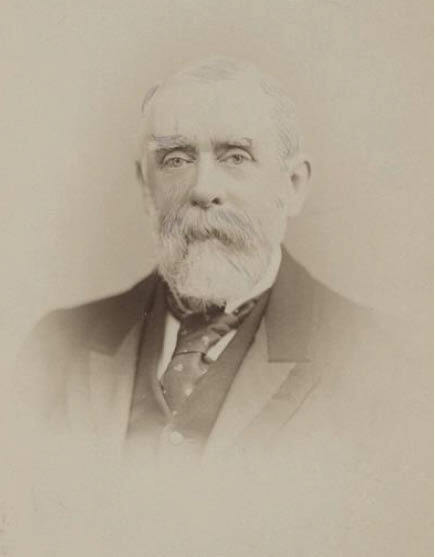 Thomas Jerram Bailey (above), was at the forefront of the timeless nineteenth century architectural style seen amongst many London colleges , of which the Sloane School was a classic example. 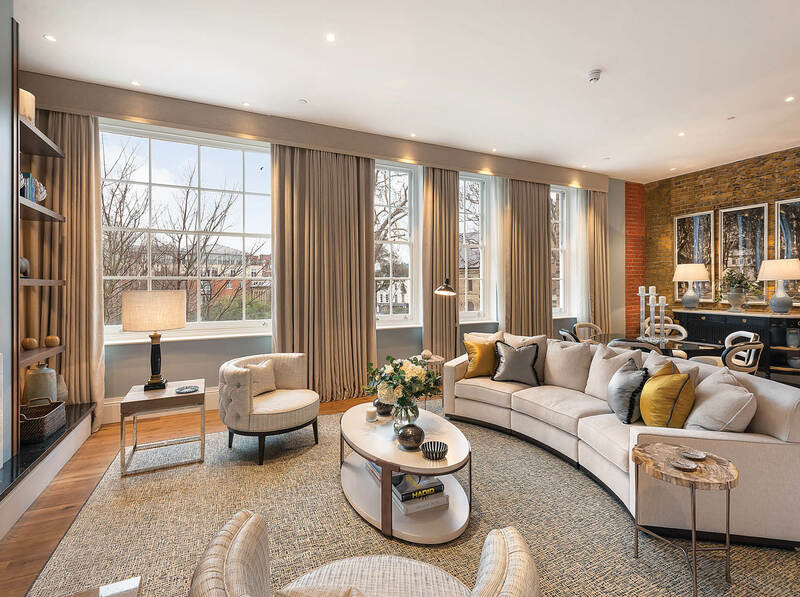 The essential character of this distinguished building has been preserved and enhanced, while the generous scale and proportions of its interiors offers a selection of 18 bespoke homes rich in both living space and natural light. 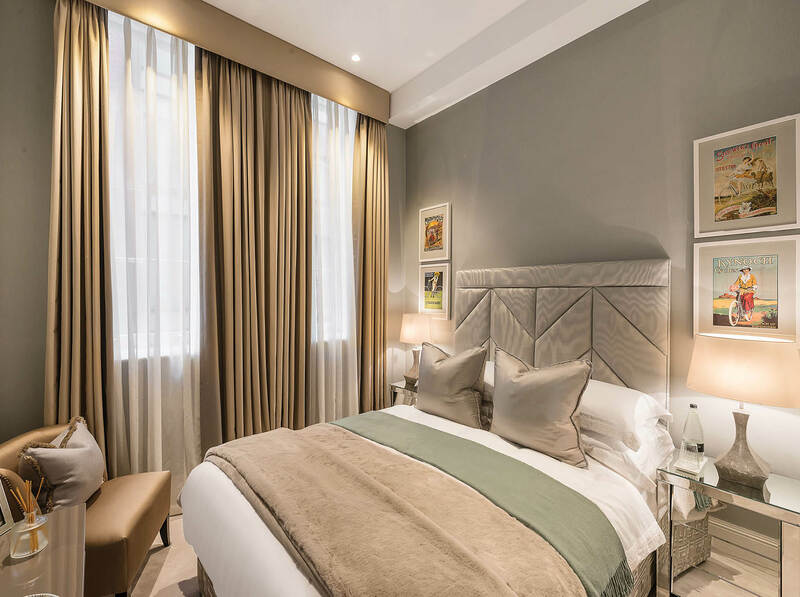 Overlooking the King’s gardens, The Sloane Building provides an opportunity to enjoy the best of Chelsea along with the sophisticated comforts of these crafted and highly individual Tenhurst apartments. The Sloane Building was built in 1908 in an engaging Edwardian style, with a wealth of large feature windows set into the brick façade to illuminate the interiors within. 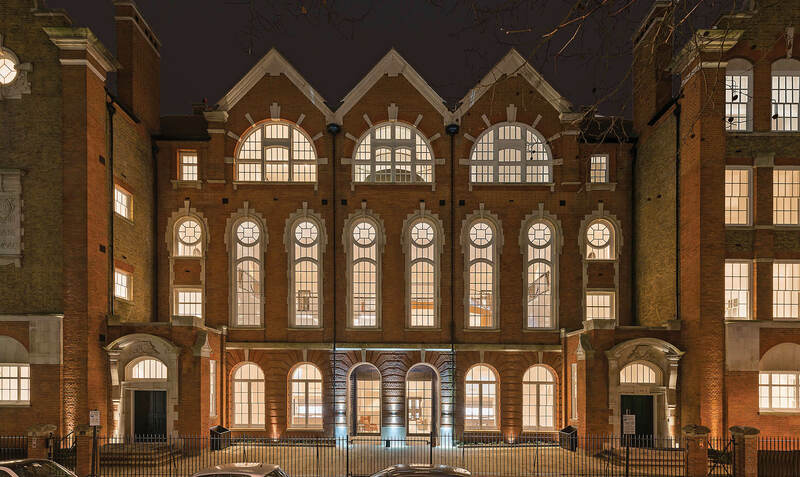 Originally known as the Sloane School, it was one of the most accomplished buildings designed by architect Thomas J. Bailey and the very first purpose-built secondary school commissioned by London County Council. 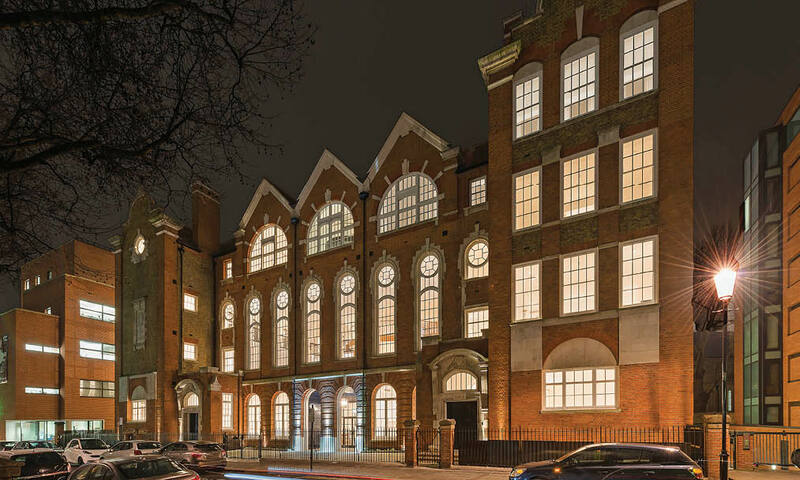 The distinctive personality of the Grade II listed school, with its soaring classrooms and dramatic internal spaces, makes it perfect for revival and conversion into private apartments. 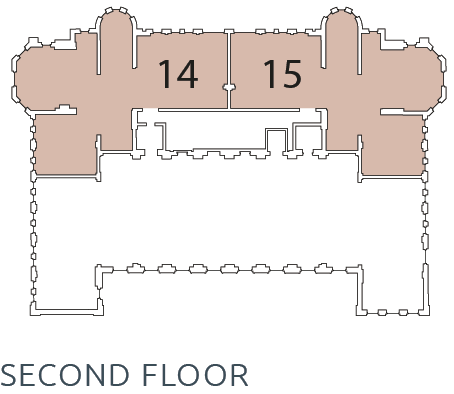 The Sloane Building retains many of the original architectural features, from spiraling staircases to large ornate windows. Bailey’s new school was built upon a site on Hortensia Road directly opposite the glasshouses and gardens of the Royal Exotic Nurseries, once famous for its collections of orchids, fuschias and other alluring plants. The Sloane School was designed as a dedicated, ‘modern’ building for girls’ secondary education and arranged over four main floors plus supplementary mezzanine levels. A large assembly hall was positioned on the first floor: a striking double height space where the school community could gather as one. Radiators and fireplaces warmed the classrooms throughout, while two staircase towers to the rear provided circulation. Spacious, light-filled living spaces maintain many of the buildings original features and character. 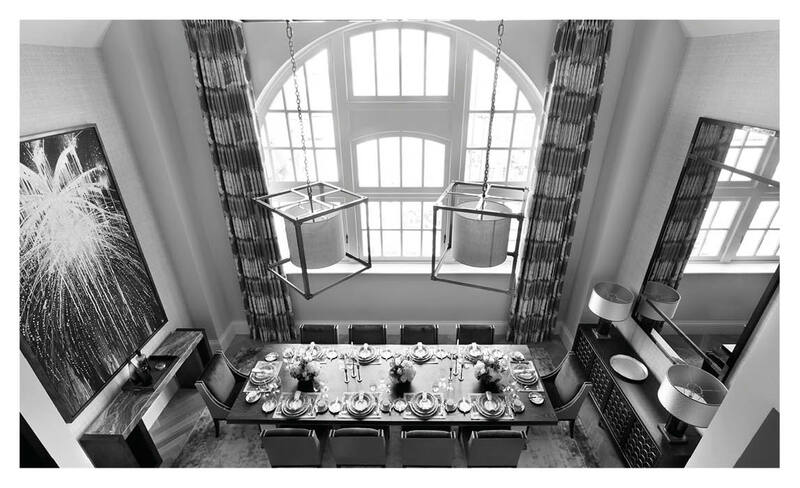 Opulent dining rooms featuring spacious open plan layouts. 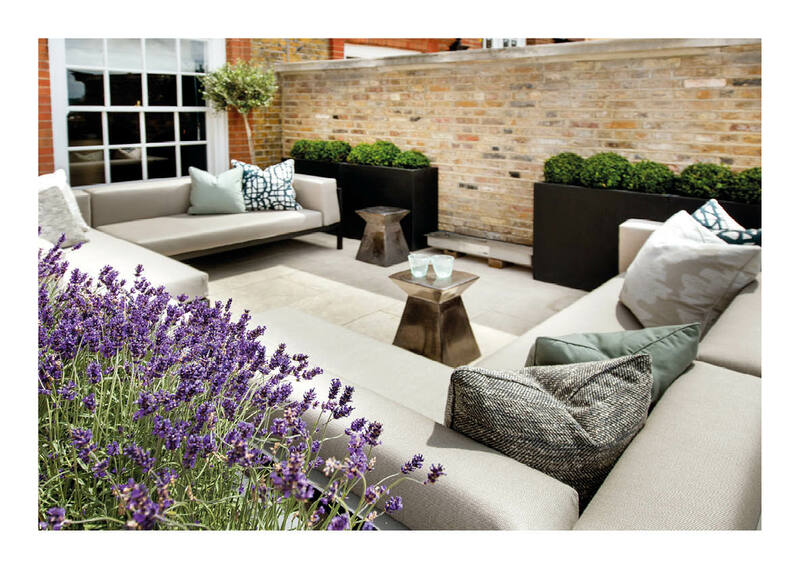 THE ROOF TERRACES ARE AN ENTICING OUTDOOR ROOM, WITH SPACE FOR RELAXATION AND OPEN AIR DINING. Master Bathrooms of the 2 & 3 Bedroom Apartments are finished with Namibian White tiled Marble. 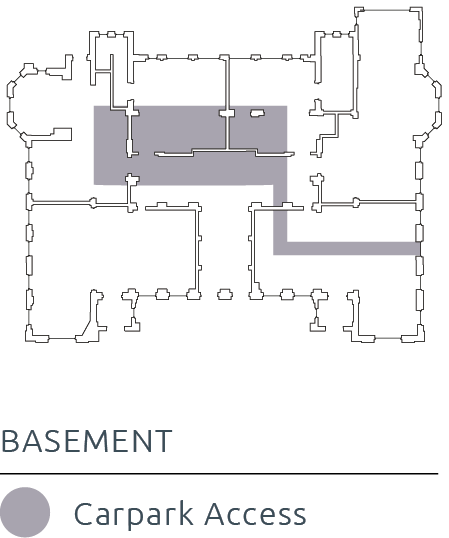 Garden apartments and duplexes on the ground and lower ground floors feature sunken courtyards and terraces with a vibrant connection between inside and outside living spaces. 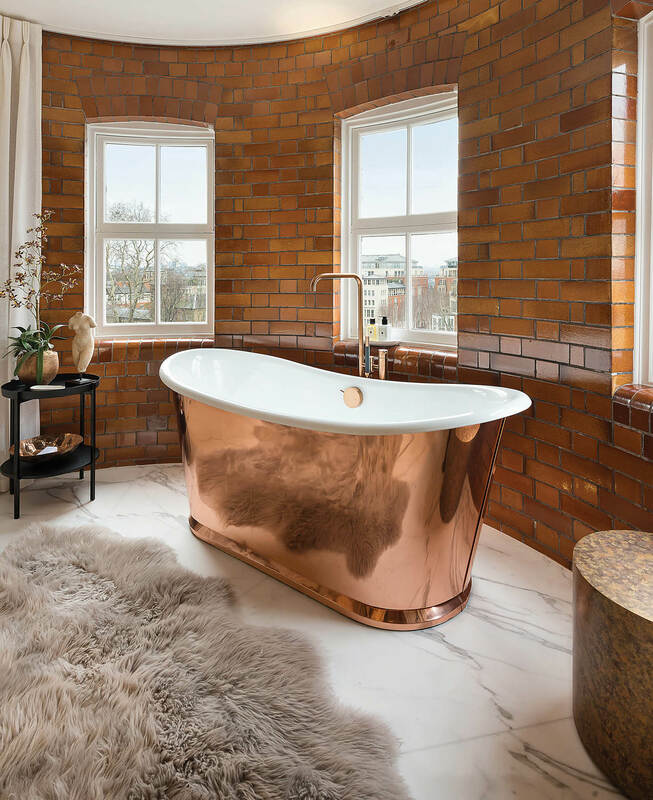 THE DISTINCTIVE PERSONALITY OF THE GRADE II LISTED BUILDING, WITH ITS SOARING ROOMS AND DRAMATIC INTERNAL SPACES, MAKES IT PERFECT FOR REVIVAL AND CONVERSION INTO PRIVATE APARTMENTS. IT’S A LAYERED BLEND OF OLD AND NEW WITHIN A CRAFTED CONTEMPORARY SPACE, WHICH IS SO RICH IN PERSONALITY AND CHARACTER. 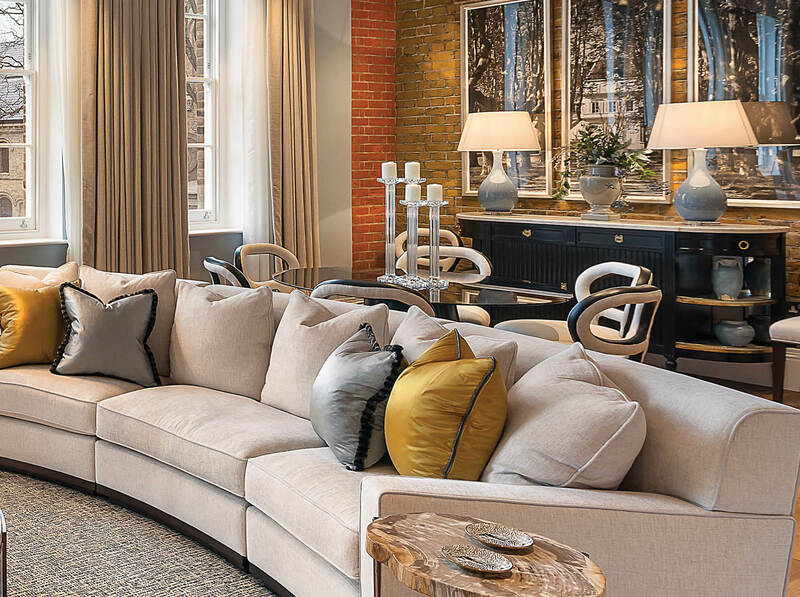 The Sloane building Apartments are perfect for relaxing & or entertaining. 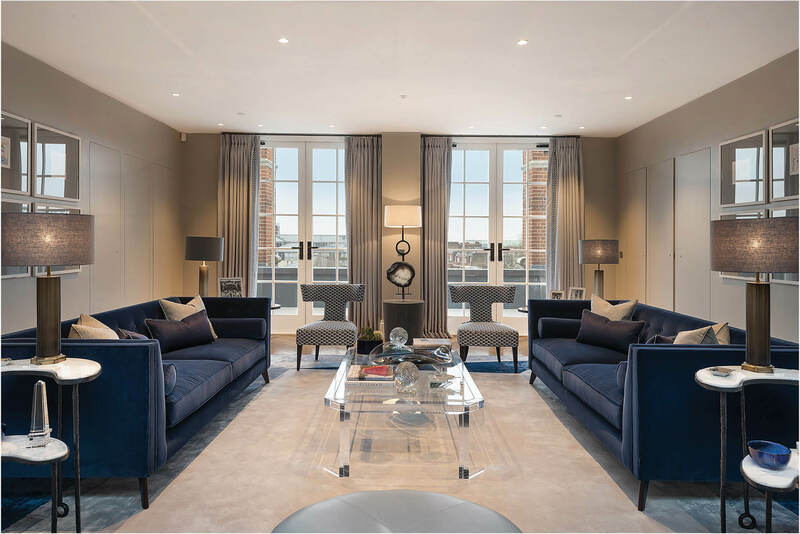 A number of Apartments throughout the Sloane Building provide supplementary mezzanine level spaces – such as dressing rooms, games rooms and studies- while reception rooms throughout are inviting with an engaging sense of both character and scale. Residences to the rear of the building enjoy expansive views of The King’s Gardens. 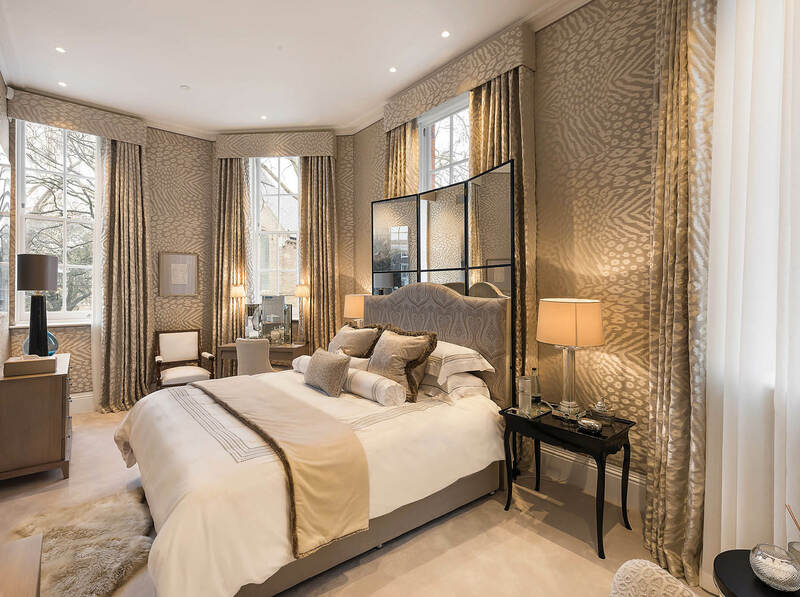 With every detail considered, The Sloane Building's bedrooms combine contemporary design with classic qualities. 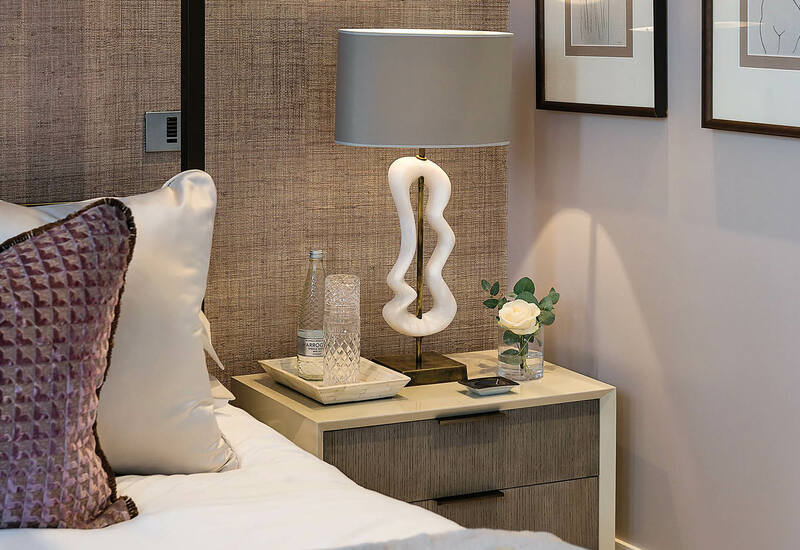 A SELECTION OF APARTMENTS HAVE BEEN FULLY FURNISHED WITH ARTWORKS, BOOKS AND STATEMENT LIGHTING. 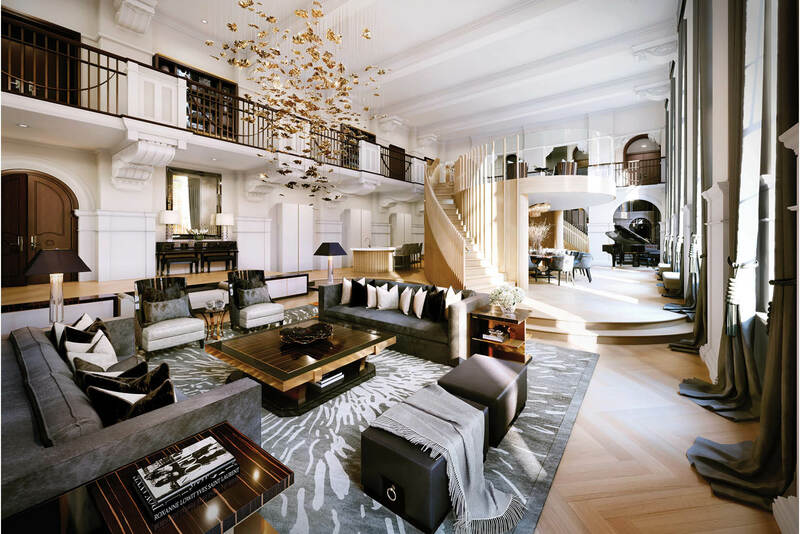 THIS HAS CREATED ENCHANTING SPACES WITH ABUNDANT CHARM PROVIDING PERFECT SHOW APARTMENTS FOR CONTEMPORARY LIVING AT THE SLOANE BUILDING. 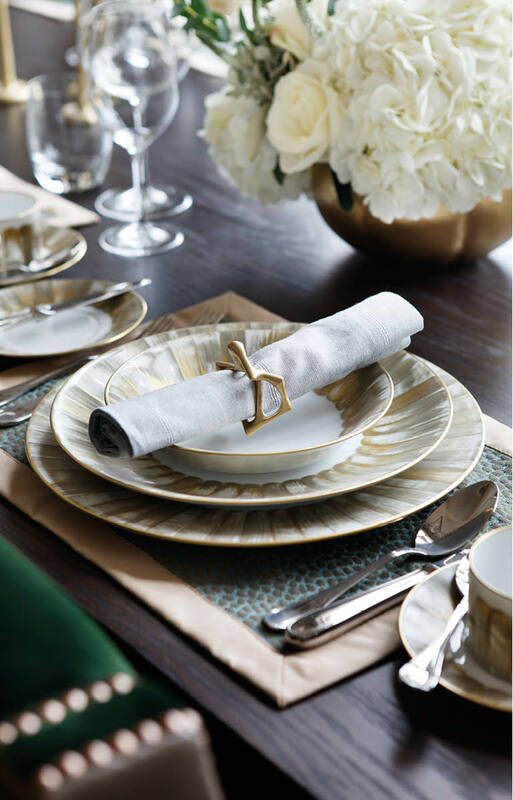 MATERIALS AND FINISHES ARE SUMPTUOUS AND WARM, WITH A WEALTH OF TEXTURES OFFERING BOTH COMFORT AND AESTHETIC DELIGHT. 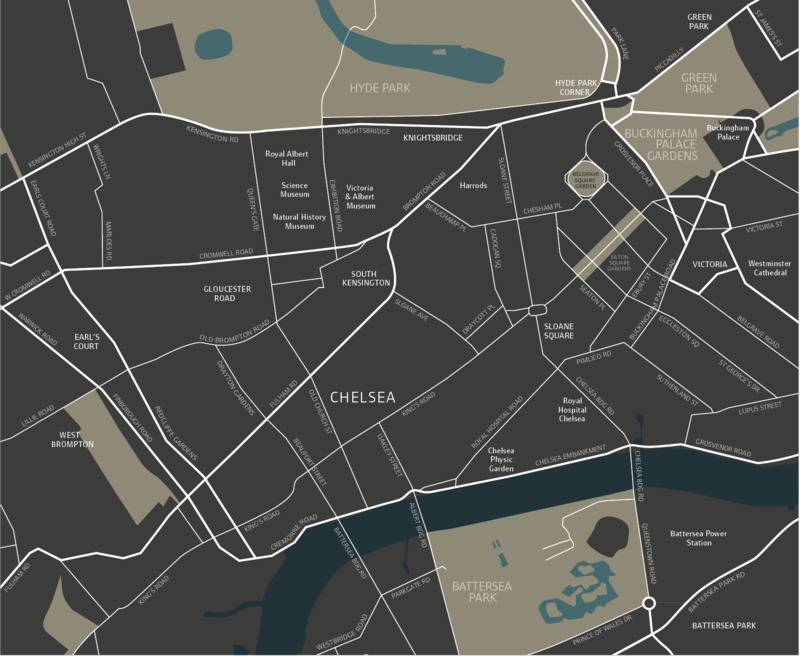 WEAVED IN AMONGST CHELSEA’S SHOPS AND GALLERIES ARE A MYRIAD OF BARS, RESTAURANTS AND CAFÉS. 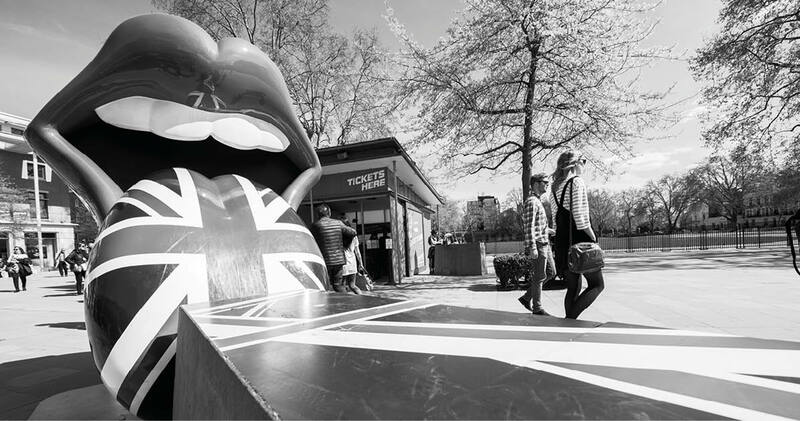 THE ROYAL BOROUGH OF KENSINGTON AND CHELSEA OFFERS ONE OF THE MOST TEMPTING CELEBRATIONS. Served by nearby tube, overground and Thames Clippers river boat services, The Sloane Building offers easy access to many of the capital’s major attractions and transport hubs. 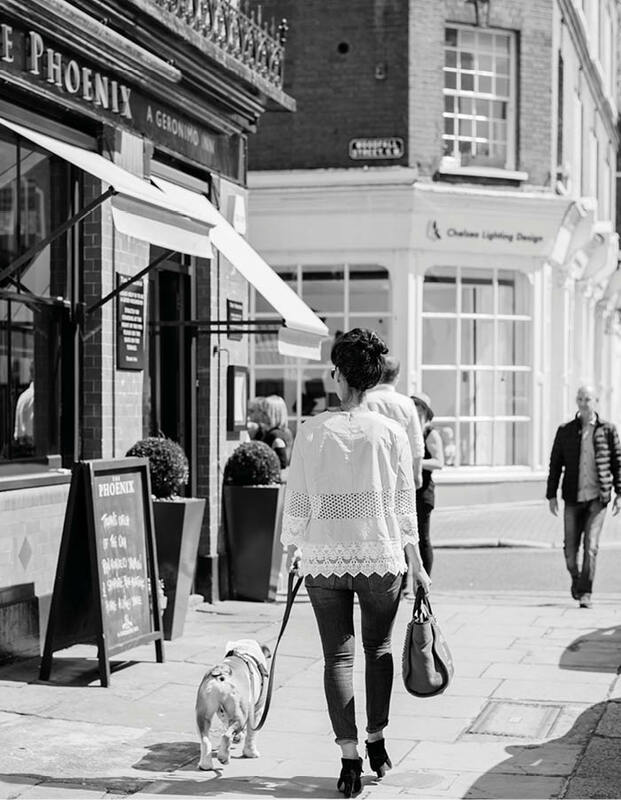 Ideally located between some of London’s most desirable areas, numerous parks, restaurant, bars and shopping districts are just a short walk away. 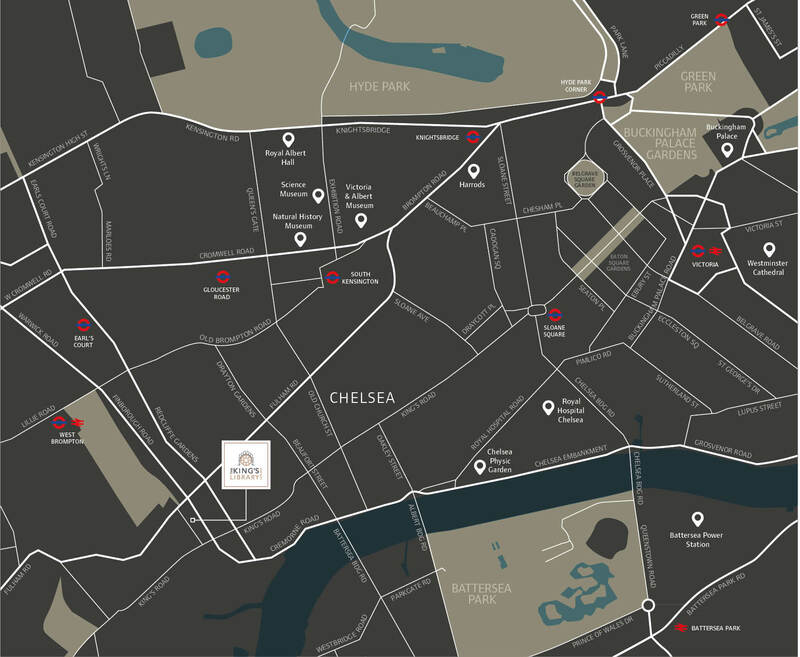 CHELSEA SITS AT THE CREATIVE HEARTLAND OF LONDON, OCCUPYING A KEY POSITION IN THE ART AND FASHION WORLDS, AS WELL AS DESIGN AND ARCHITECTURE. 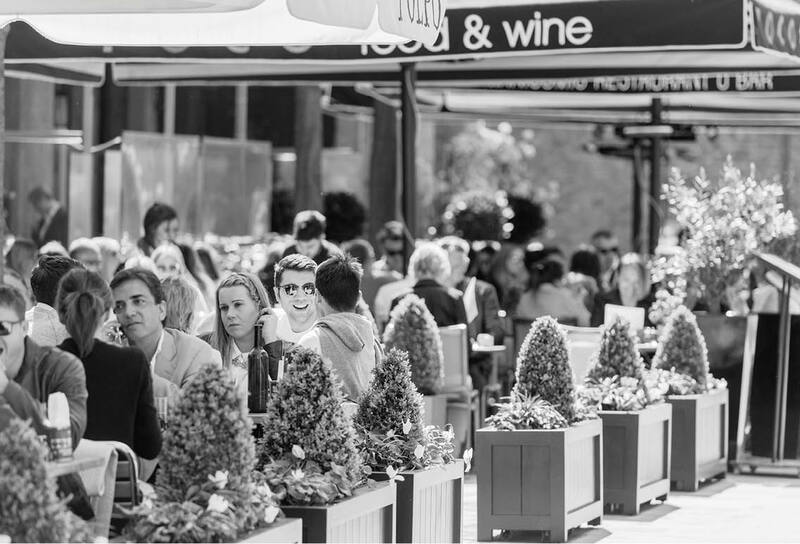 Chelsea is home to a delicious selection of restaurants from the formal to the informal, from the familiar and local to the multi starred and international renowned. 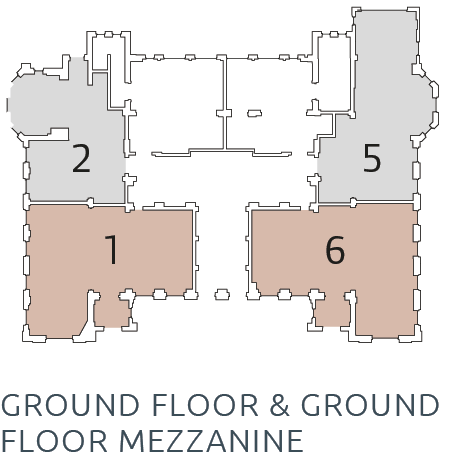 SPREAD OVER FIVE LEVELS, EACH APARTMENT OFFERS SPACIOUS, OPEN-PLAN AND LIGHT FILLED SPACES. 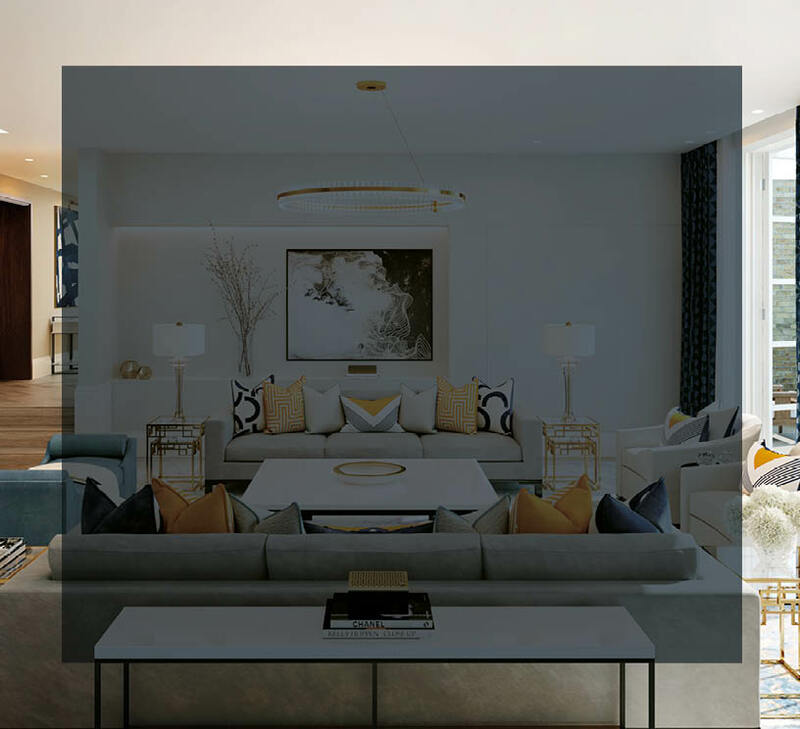 Please note that all aspects of the design and specification for the development at Sloane Building, London SW10 are continuously reviewed and Hortensia Property Management LLP reserve the right to make alterations to the design without notice. MAIN ENTRANCE LOBBY Outer portico and entrance lobby (double height). Inner entrance lobby metal framed glazed double doors. Bespoke designed and handcrafted concierge desk. Natural Stone flooring. Floor and pendant lantern lighting. Fully integrated building management system for metered utilities. 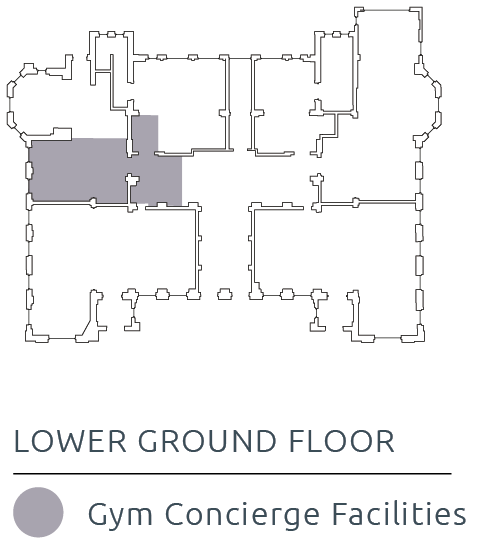 LIFTS AND CAR PARK Two passenger lifts serving all floors with direct access link to underground car parking. Leasehold car spaces within CCTV monitored underground car park. SECURITY 24-hour concierge with CCTV monitoring. Fob access to all main entrance doors, lifts and underground parking. Smoke and heat detectors including a domestic sprinkler system. Multi-point locking to all apartment entrance double doors. APARTMENT FINISHES Main entrance fumed oak feature panelled double doors. 4 & 5 Bedroom Apartments to include fumed oak veneered panelled doors. Bespoke bronze ironmongery. Fully carpeted Bedrooms. Oak engineered herringbone parquet flooring. 2 & 3 Bedroom Apartments to include internal white powder coated doors. Bespoke bronze and nickel ironmongery. Oak engineered plank flooring. 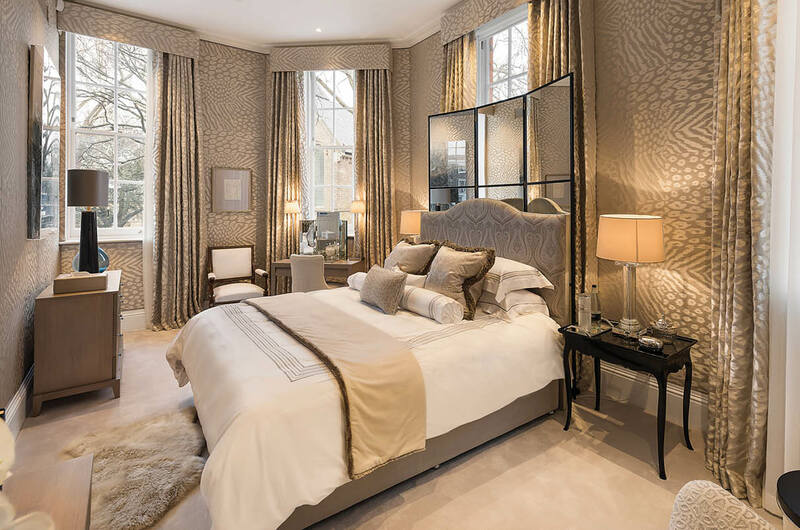 Fully carpeted Bedrooms. KITCHENS Bespoke kitchens with individually designed layouts. Composite stone worktops with large under-mounted stainless steel sinks. Re-circulating integrated stainless steel extractors. 4 & 5 Bedroom Apartments to include integrated utilities/ laundry space. A selection of Gaggenau integrated appliances. Timber herringbone parquet or large format tile flooring. 2 & 3 Bedroom Apartments to include a plumbed utility space. A selection of Miele integrated appliances. Timber Plank or large format tile flooring. BATHROOMS Master Bathrooms of the 4 & 5 Bedroom Apartments finished with Italian Calacatta Oro slab marble. Guest bathrooms finished in large format marble tiles. Wall hung vanity units with surface or under-mounted hand basins. Wall mounted WC pan with soft close seat and concealed cistern. Flush floor wet room shower areas with frameless glass screens. Heated ladder towel rails. Mirrored cabinet with shelving, shaver socket and concealed lighting. Master bathrooms of the 2 & 3 Bedroom Apartments will be finished with Namibian white tiled marble. Guest bathrooms finished in large format porcelain tiles. Wall mounted WC pan with soft close seat and concealed cistern. Flush floor wet room shower areas with frameless glass screens. Mirrored cabinet with shelving, shaver socket and concealed lighting. ELECTRICAL INSTALLATION Video entry at all apartment main entrance double doors. Lutron LED lighting systems with programmable scene setting. Television and phone points to all reception rooms and bedrooms. Programmable Crestron control System. Wired for audio, ready for owner’s installed preferred audio/visual equipment. Power and telephone points provided for the installation of intruder alarm systems. MECHANICAL INSTALLATION Under floor heating to hallways, reception rooms and bedrooms. Crestron panel controlled comfort cooling to reception rooms and master bedrooms. Heating and hot water supplied and metered from a building central building plant system. TENURE & MANAGEMENT 999 year lease. 10 year BLP building defects liability warranty backed by Allianz. 24 hour concierge service. Building management and maintenance services by Qube. Service charges levied for all main building services. 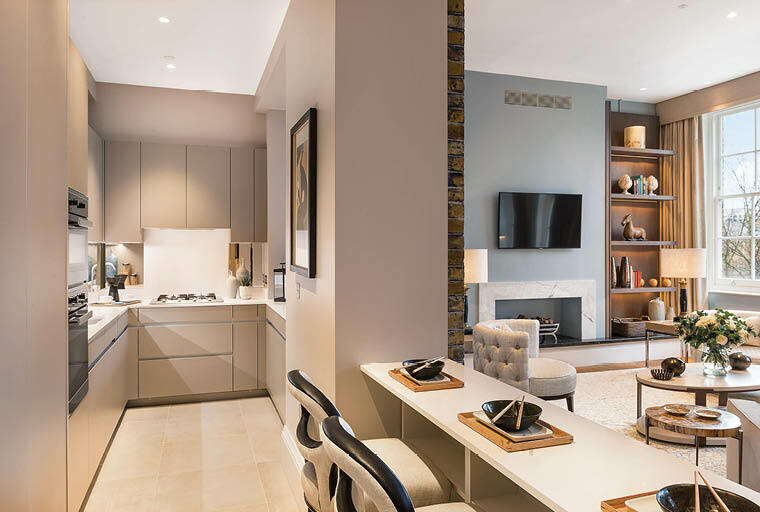 Residents of the Sloane Building Development are not eligible for a Resident’s Parking Permit in The Royal Borough of Kensington and Chelsea. Please note that aspects of the design and specification may vary from unit to unit to suit the individual layout and design. What pleases you most about the final designs for the Sloane Building? 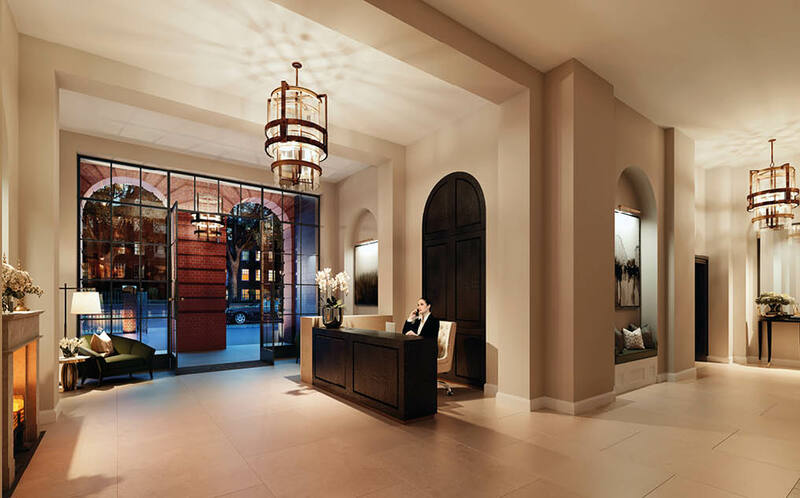 The common parts of the Sloane Building speak of sophistication and elegance. 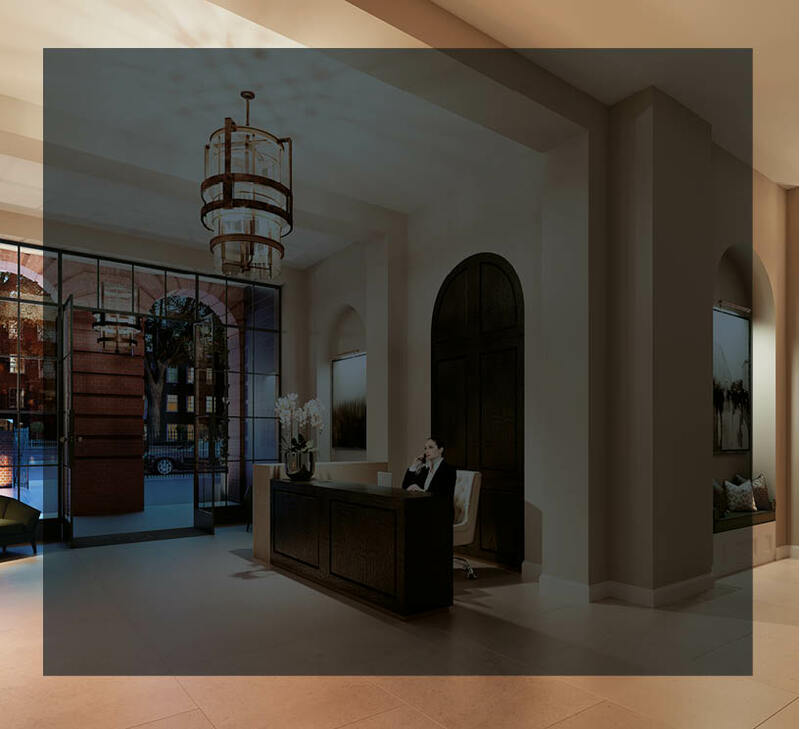 A welcoming entrance hallway sits within a beautifully appointed double height space, with soaring ceilings and refined finishes. 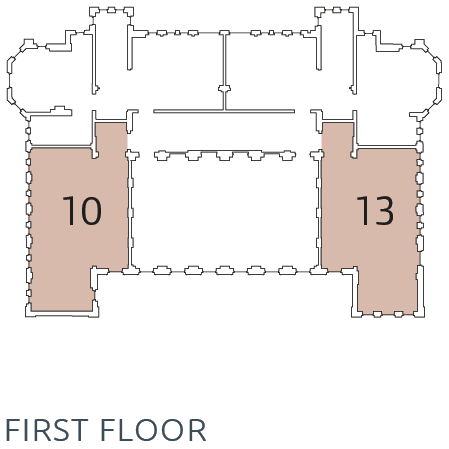 It leads through to the twin lifts and staircase, as well as providing a route to the rear hall, which flows out to the quiet parkland of The King’s Gardens. The large open spaces of the Sloane Building make it a very exciting canvas to work with. 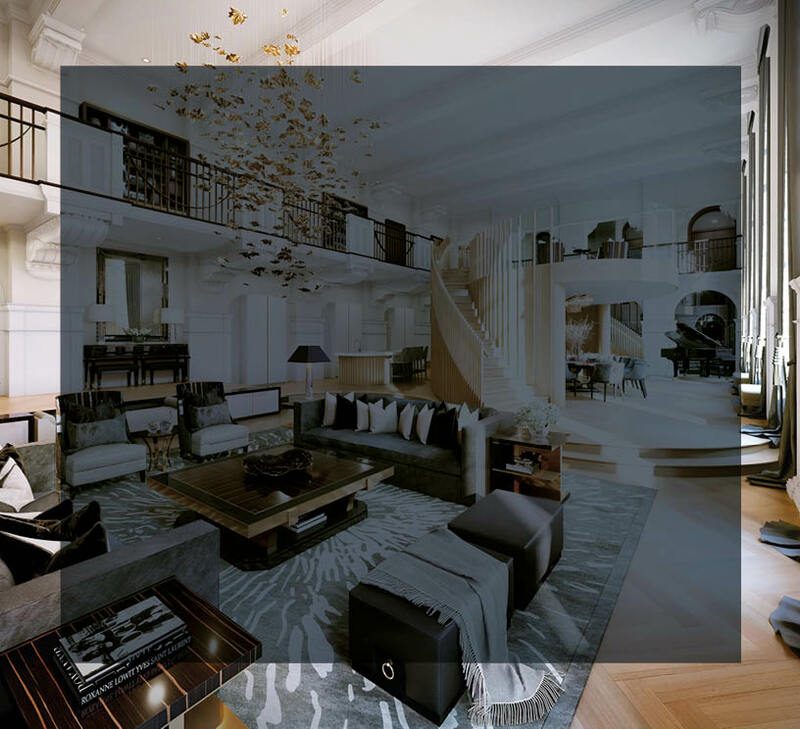 The property is situated in one of the most design focused districts of the capital, being home to many artisans, artists and luxury brands and I wanted to bring these influences into the design of the building. 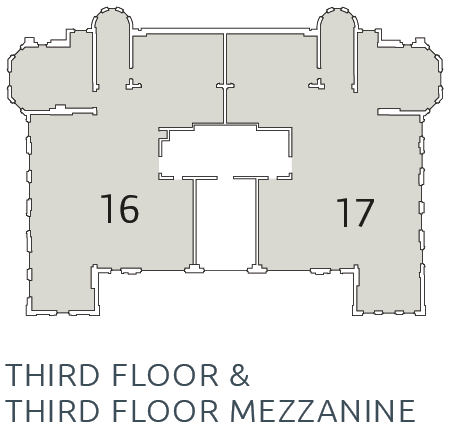 The richly layered and inviting interiors of the Sloane building offer a contemporary response to the character of the building itself and its context. 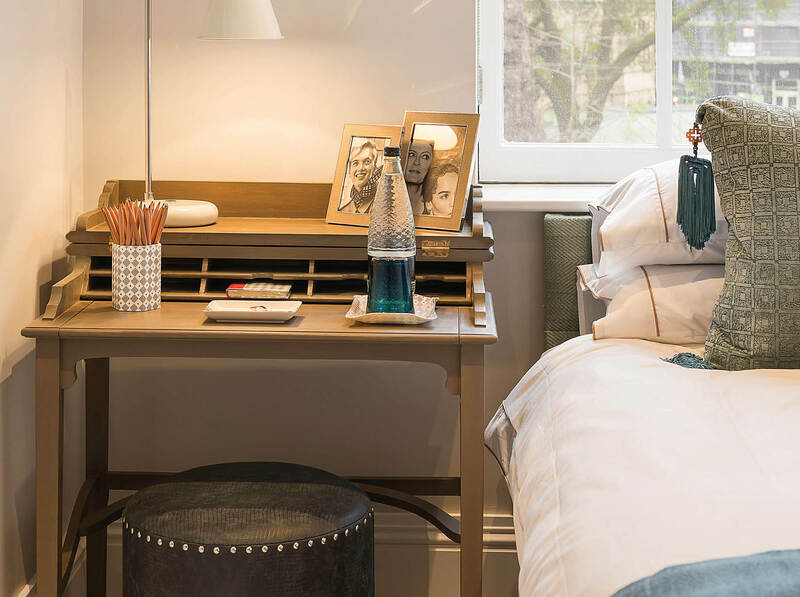 The apartments nod to the brilliant and rich history of British design with all the modernisations and everyday luxuries needed for day to day life. 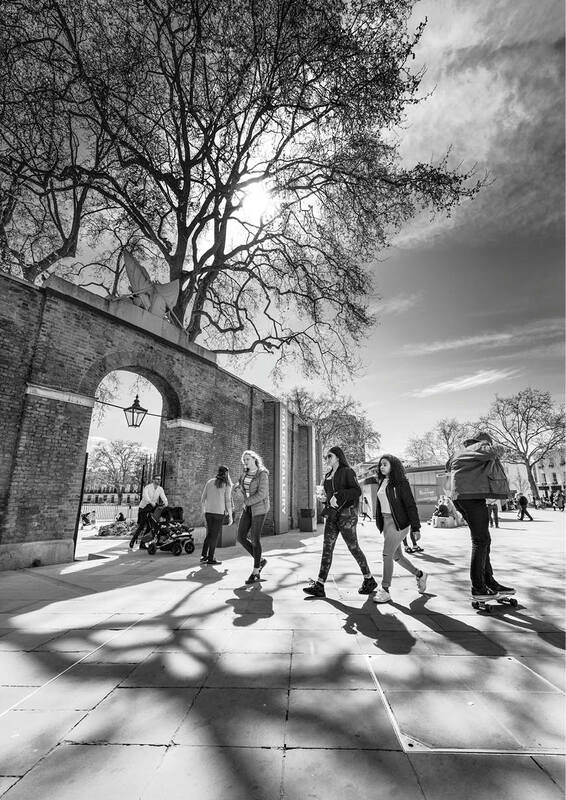 The building celebrates the fast-paced city in the landscape below but carves out a spacious haven from which you can enjoy it at your own pace. 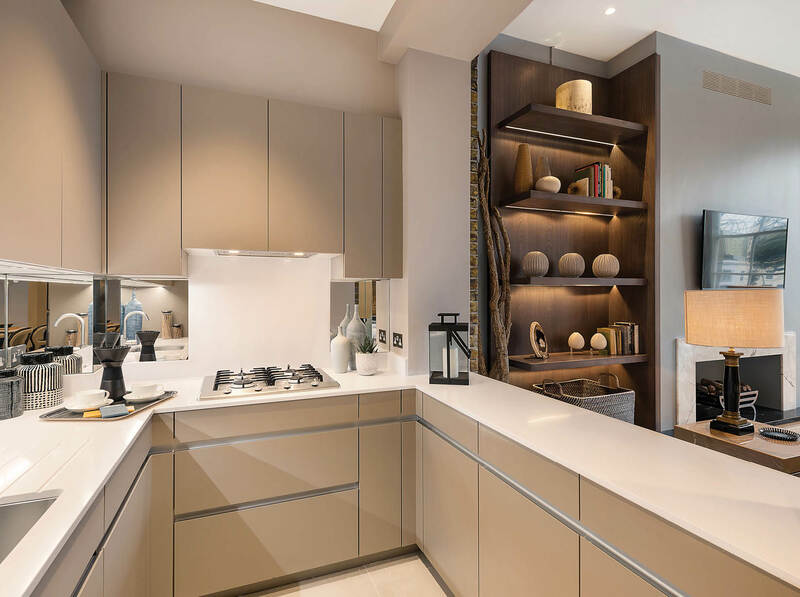 The property has a mix of high and low ceilings with split levels that create wide open spaces, so, designing the penthouse involved very complex space planning. The result is something that flows and offers a living experience unlike any other. 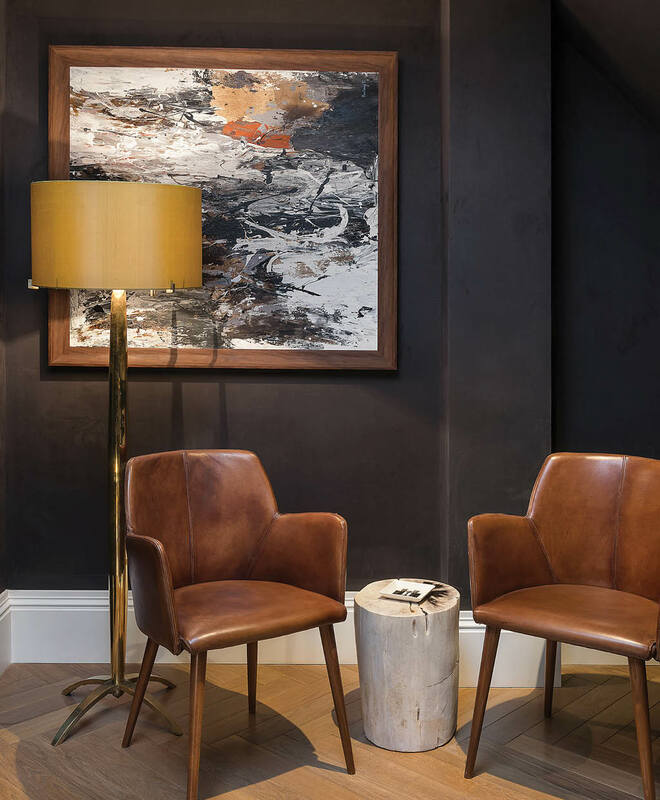 Utilising these spaces was so important and enabled me to install breath-taking artwork such as the fluttering, gold pendant chandelier, by Parisian artist Christel Sadde. 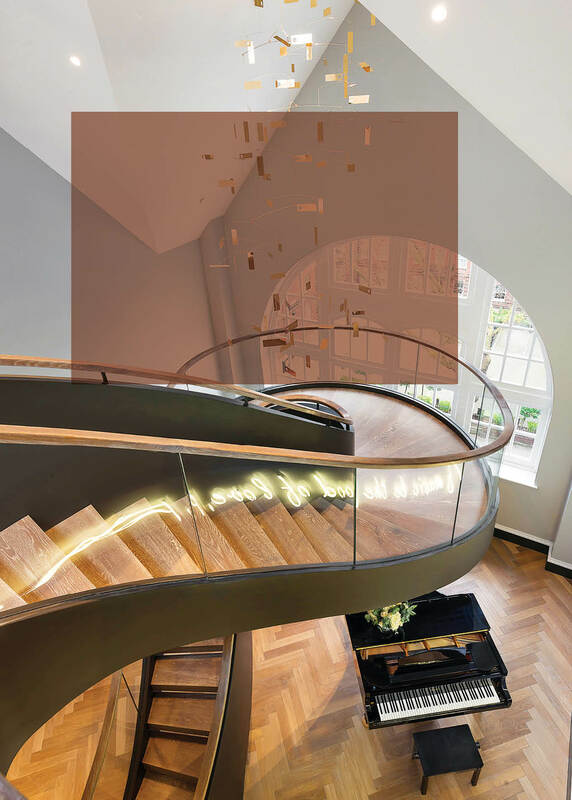 The staircase makes use of the dramatic double height space and a piano enjoys the acoustics of the generous volume when there are guests to be entertained. I thought it was a very happy, contented building. You can imagine what the school must have been like when it was full of pupils, with the separate girls and boys entrances at either side and it had a particular dynamic. There are some amazing spaces and so the idea of clearing away some of the temporary partitions that had been put in when it was an art school and getting back to the real fabric of the building made a lot of sense. John Hunter and Tenhurst were clear that they didn’t just want to cram as many apartments into the building as possible and the challenge he set was to go away and think about what works best for that building. The end result puts a use back into the building and makes the building feel comfortable again. The spaces are all balanced and each of the rooms and each of the windows feel comfortably positioned. It’s giving an old building a new lease of life and the new fits inside the old very naturally, like a hand in glove. THE INTERIOR ARCHITECTURE OF THE APARTMENTS HAS BEEN PARTLY GUIDED BY THE DYNAMIC NATURE OF THE BUILDING ITSELF. When we talked to the planners, the conservation officers and English Heritage they were all keen that we retained the character and spirit of the building. 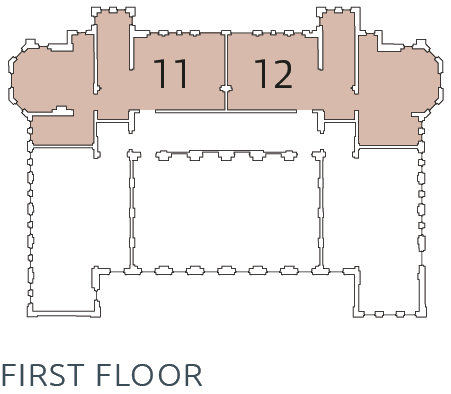 That translated into some of the original circulation routes and stairways being preserved within the layouts of the new apartments but also the spirit of some of the original spaces within the school, in particular the main assembly hall at first floor level with the principal windows facing Hortensia Road. We have inserted a contemporary living pod into the hall that mediates between the volume of that space and the human scale and it works very well, even though it was a challenging space. There will be a unique sense of identity and place within those apartments, which is a great thing. How many people now work in the practice and how many different sectors do you cover? 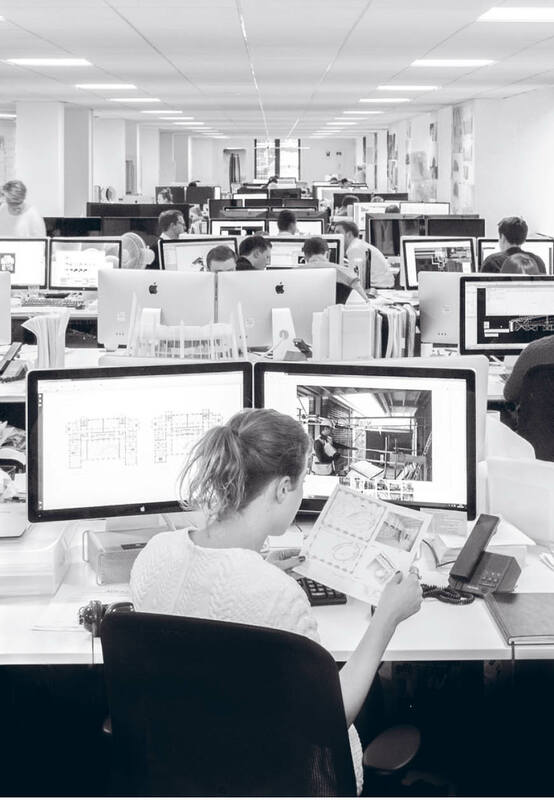 To what extent has JWT’s approach to the interiors of the Sloane Building been guided by the character and history of the building itself? 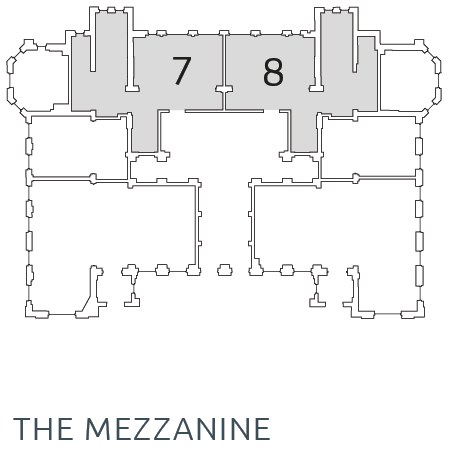 What other key qualities or characteristics help make the Sloane Building show apartments unique in your view? 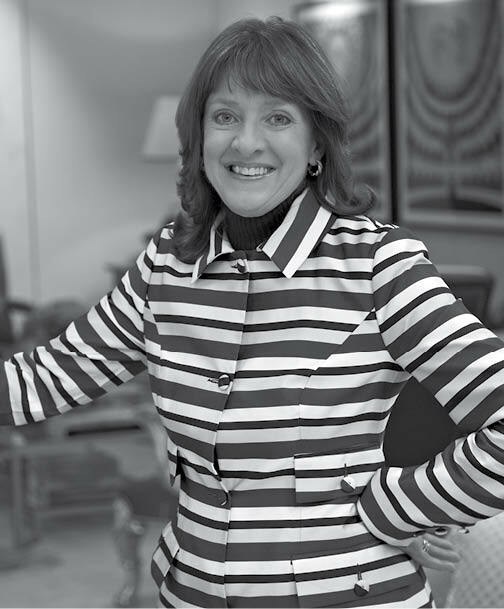 Joanna Wood and her team bring to each project care and attention to detail, creating a timeless style that combine traditional and contemporary elements to produce a visually exciting and practical result. The thing we really wanted to get right was giving the building back its sense of integrity and having this hand in glove feel between new and old that really works. No matter which space I go into, it is working and we are delivering what we set out to do, which puts a smile on my face. The materials and finishes that we are introducing are very contemporary but they work extremely well in the fabric of the building. 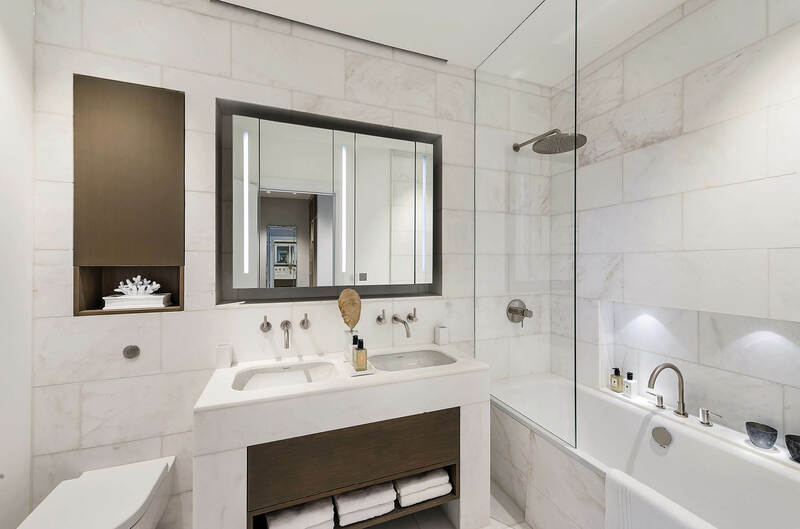 Each of the eighteen apartments at the Sloane Building has been individually designed by APT Architects, drawing inspiration from the character of Thomas J. Bailey’s architecture while also creating custom designed homes for contemporary living. These tailored apartments make the most of the sense of space and volume seen within the building’s original classrooms, hallways and circulation spaces. We had all the constraints of the original building, but this makes it such an interesting property. 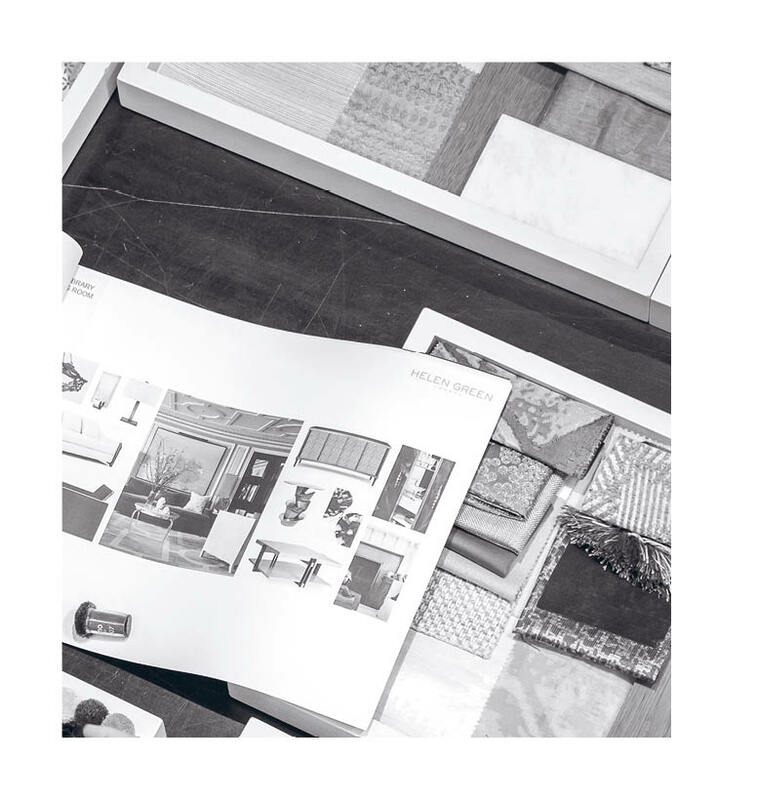 We had to give a raison d’être to all the spaces in order to bring a new purpose to them all, changing it from an early 20th Century school to a luxury home. 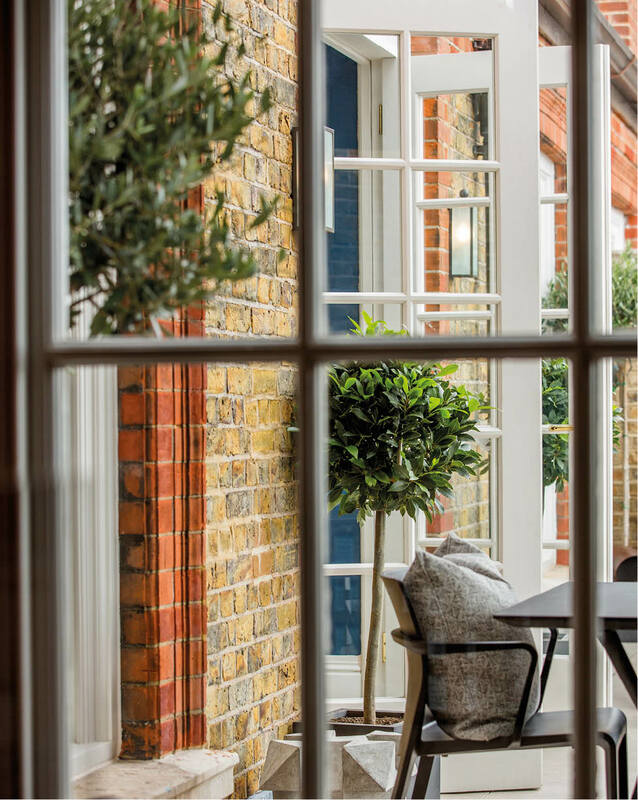 Keeping the original and historical features of the property and working with them to ensure that the character and charm is still centre stage. How important was it to create living spaces that responded to the generous scale and volume of the original architecture? 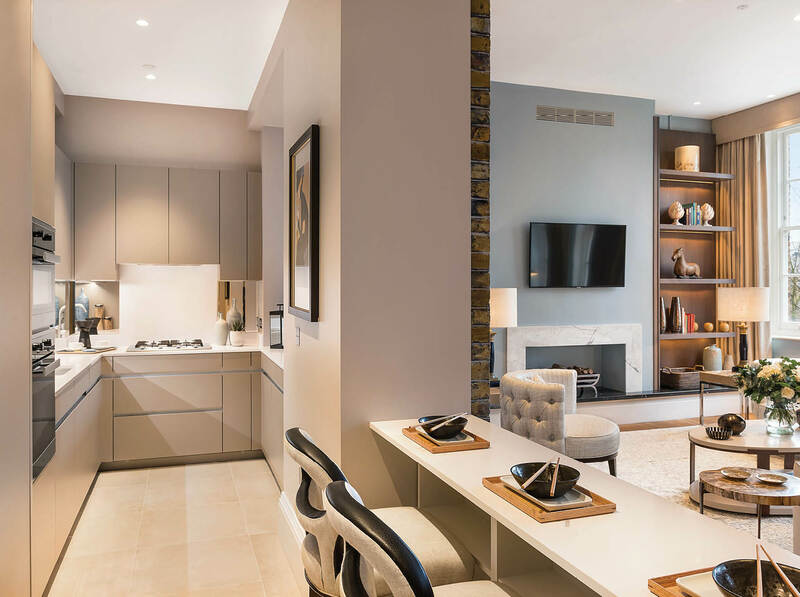 To what extent do the show apartments provide a full picture of what the experience of living at the Sloane Building is all about? 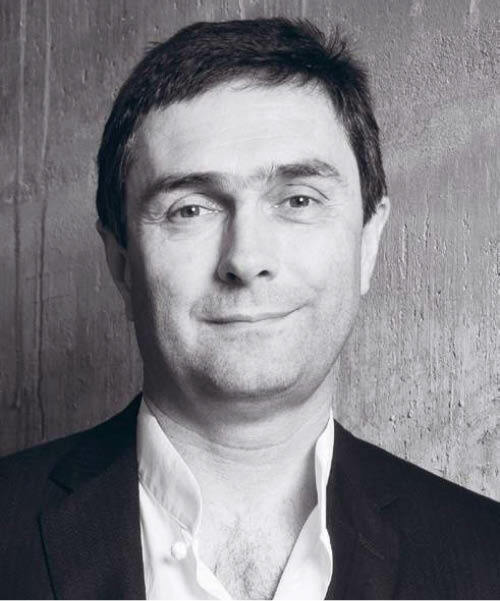 The highly regarded Robin Partington (above) and his practice have been integral to the architectural revival and remodelling of the Sloane Building. What makes the Sloane Building project so special for you? We have around 60 people in the studio, including part one students on placement, who are such good fun to work with. We covered a lot of different sectors from the beginning, including fit outs of our own buildings. We do all kinds of residential, from affordable housing to private houses to small groups of apartments and large scale developments. We do all sorts of commercial office space and we do hotels, leisure, infrastructure and cultural projects – we have just finished the Treasury exhibition space at the Bodleian Library at Oxford University. It’s a very healthy spread of clients and projects. 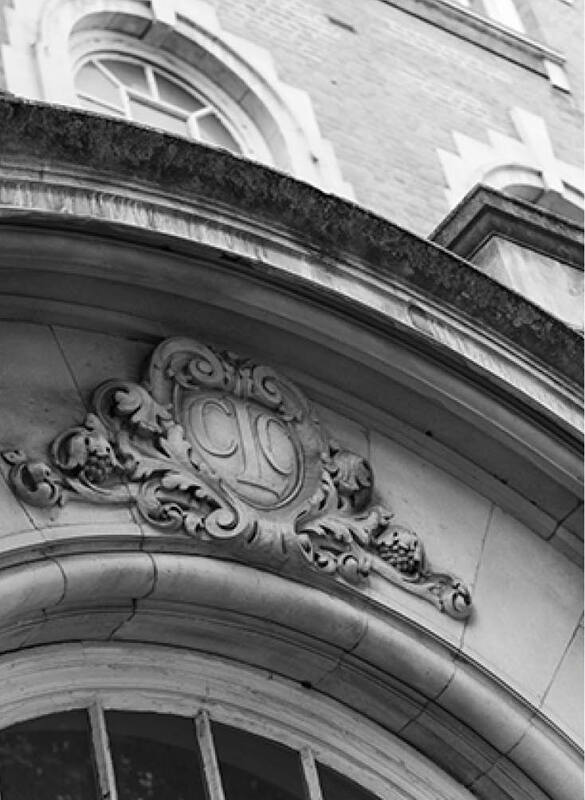 What was your first reaction to the Edwardian school building that now houses the Sloane Building? 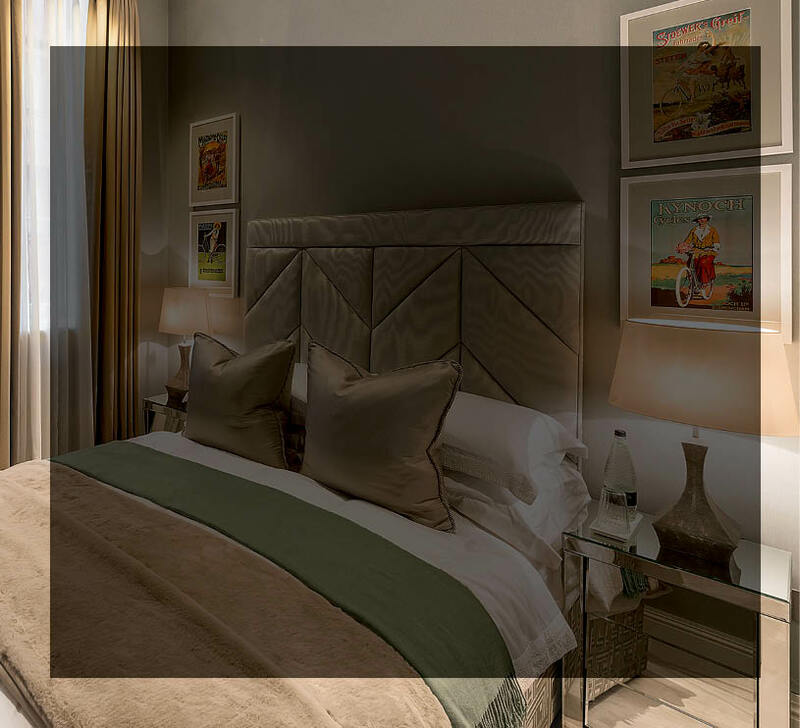 Each and every room has been individually conceived, creating an experiential journey through a range of unique spaces, from split level bathrooms, hidden gyms to soothing bedroom retreats. 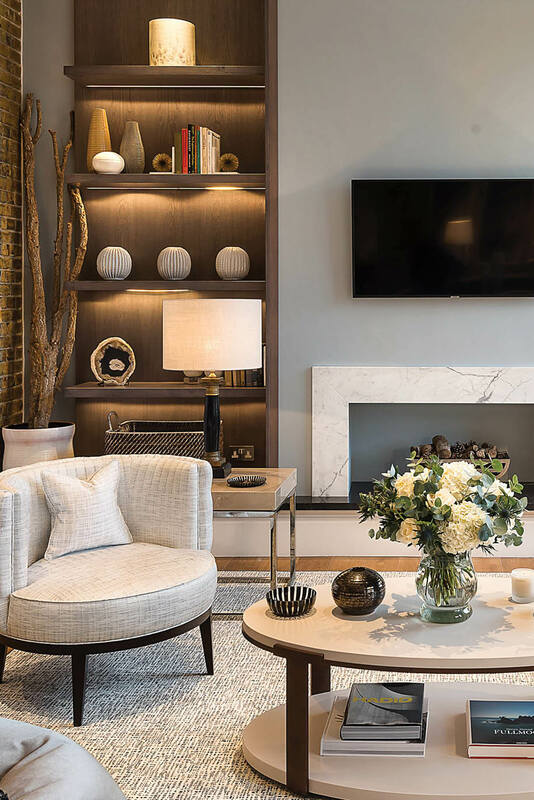 The Sloane buildings apartments are designed to be welcoming, elegant and sophisticated, but also to be practical and flexible with ample provision for integrated storage as well as fixtures and fittings of the highest specification. The building captures all of London’s spirit - the mix of old and the new. The City is ever-evolving and in a way so is the Sloane Building. 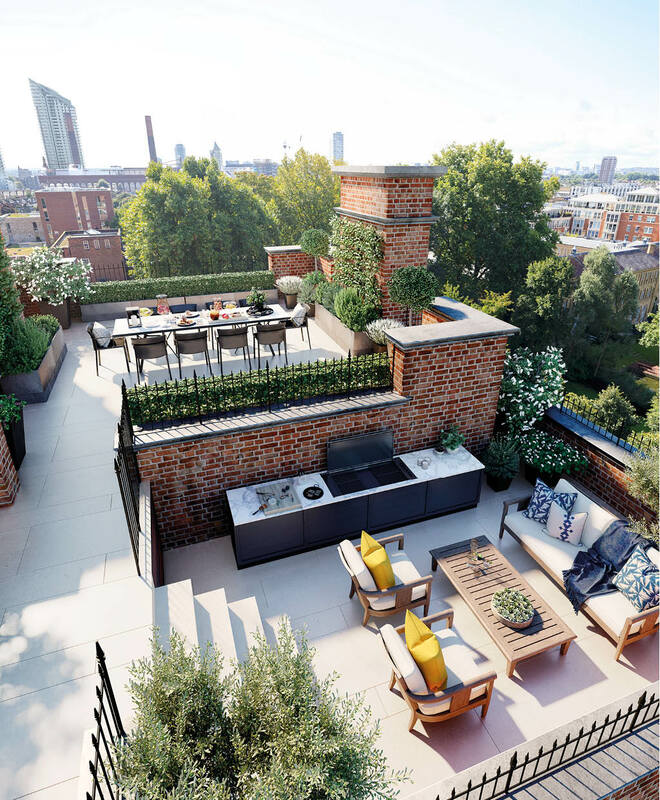 The space is unrivalled inside and out, in the living room the glass roof opens leading to five spacious roof terraces with London-wide views. The property has a character and drama that cannot be replicated anywhere else - just see the split-level bathroom. 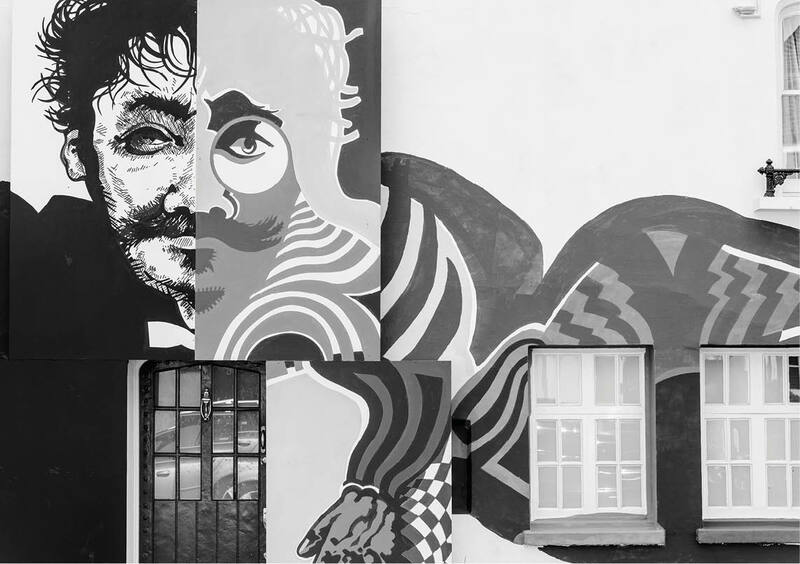 I’d also say that the Sloane Building is a joy for anyone with an art collection or a wish to start one - the spaces available are crying out to be populated with paintings and artworks of all sizes and genres. 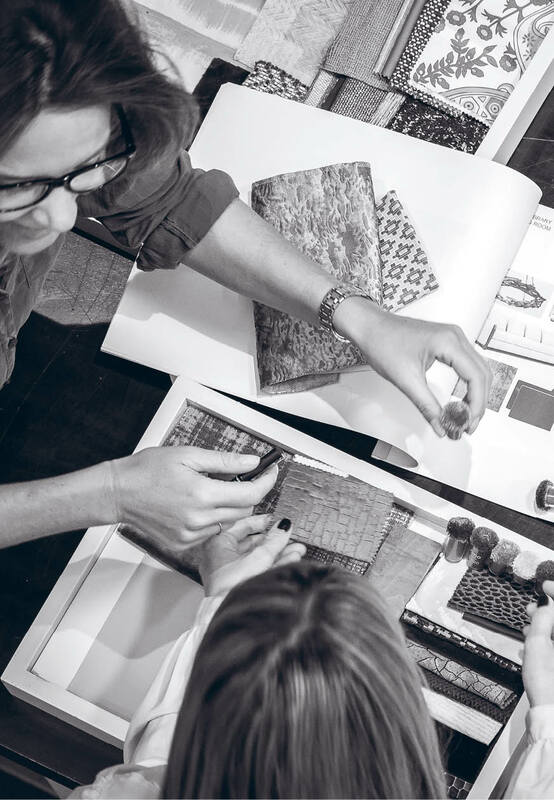 The Joanna Wood Studio has a wealth of experience in interior design and interior architectural design as well as furniture and product development. THESE TAILORED RESIDENCES MAKE THE MOST OF THE SENSE OF SPACE AND VOLUME SEEN WITHIN THE BUILDING’S ORIGINAL CLASSROOMS, HALLWAYS AND CIRCULATION SPACES. What was the greatest challenge architecturally in adapting and reviving the Sloane Building? 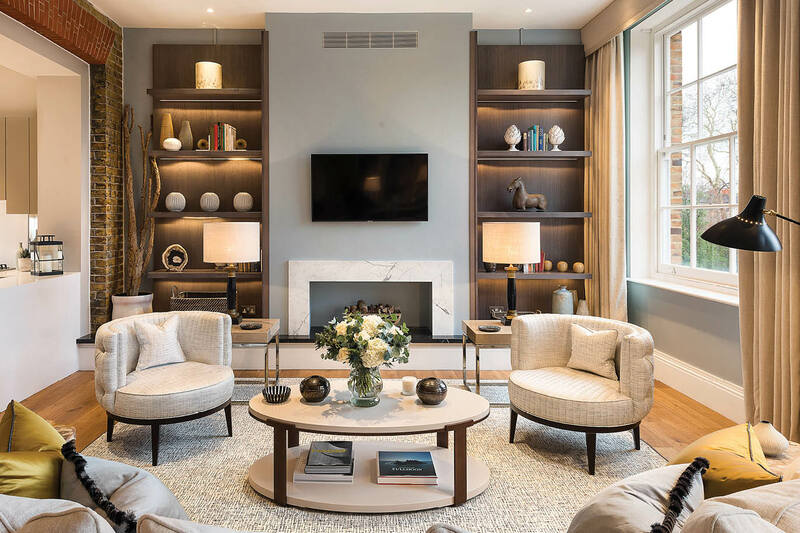 Joanna Wood has seamlessly blended the history and character of the Sloane Building with the demands of modern life, celebrating its architecture whilst carving a new purpose for it. 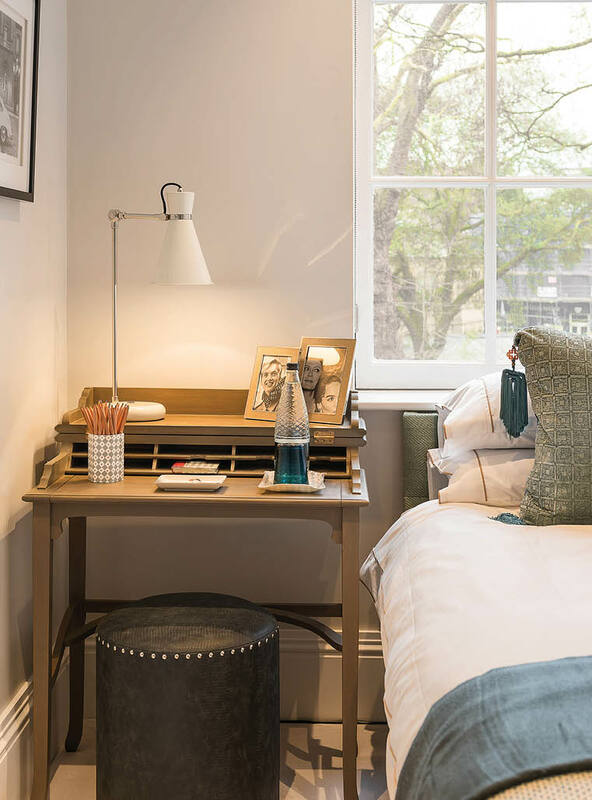 The apartments marry timeless design with expertly used bold colour, textures and artworks transforming this from an early 20th Century school to a luxury home. 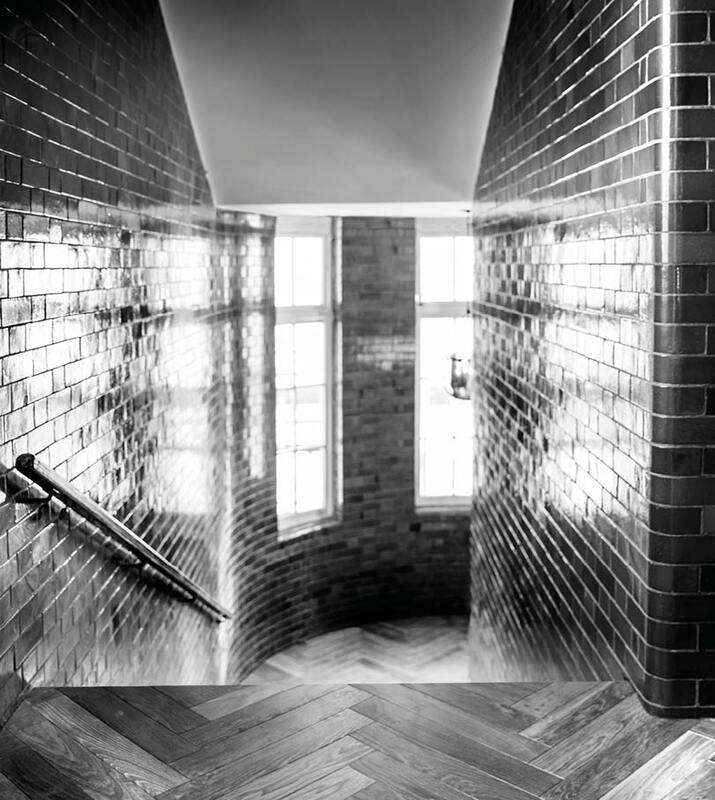 Exposed brick and parquet flooring are just some of the charming historical features which give this property character. 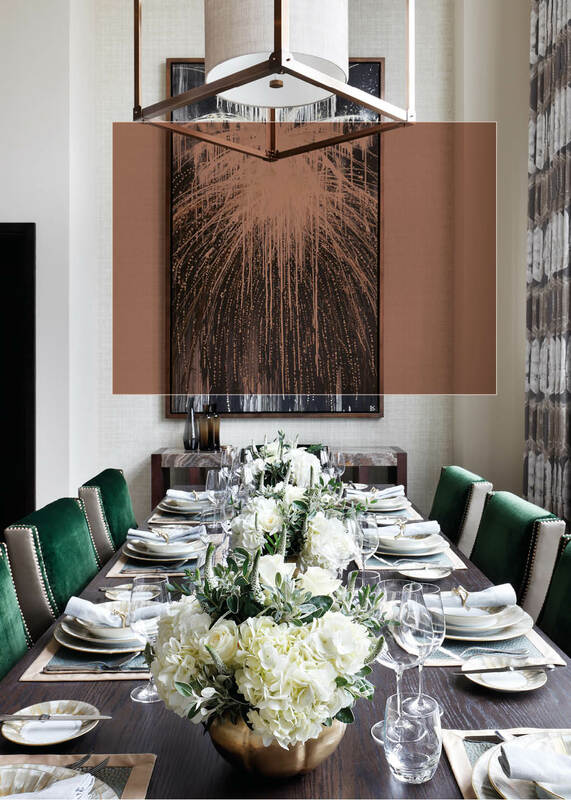 The sumptuous colour palette paired with design classics, like wishbone dining chairs and mid-century lighting, create a warm and enticing interior. 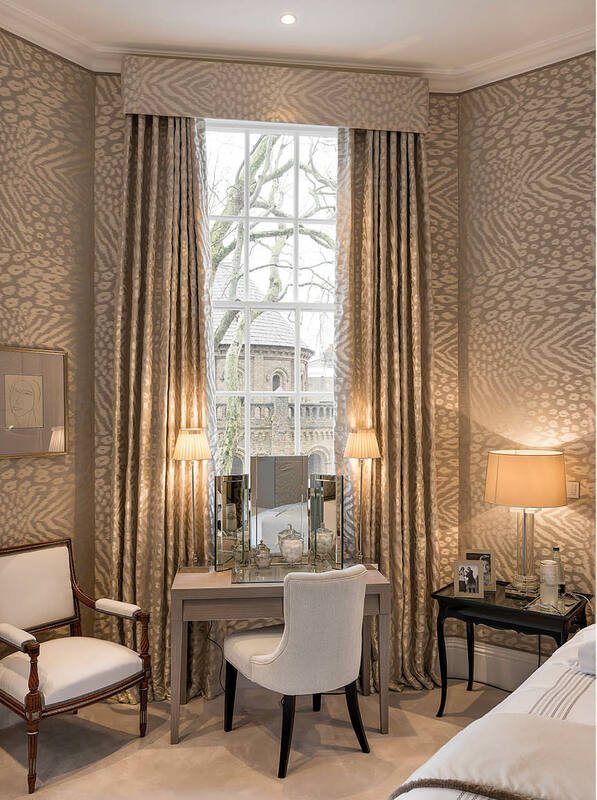 Playful details such as animal print in neutral tones, colourful vintage prints by the bedside and bold painterly wallpaper in the bathroom, add an energy inspired by the spirit of London. 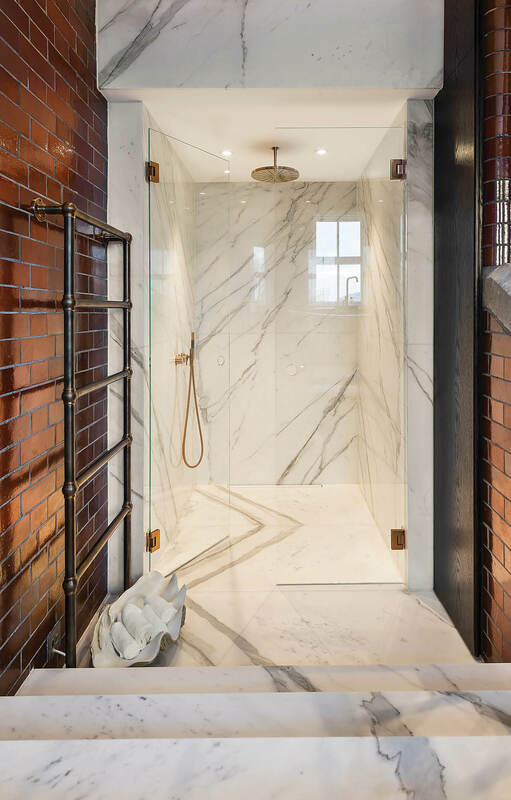 Visually intriguing spaces result in a home that is entirely unique yet in tune with everyday living - this can be seen in a split-level bathroom and elsewhere with the gym. 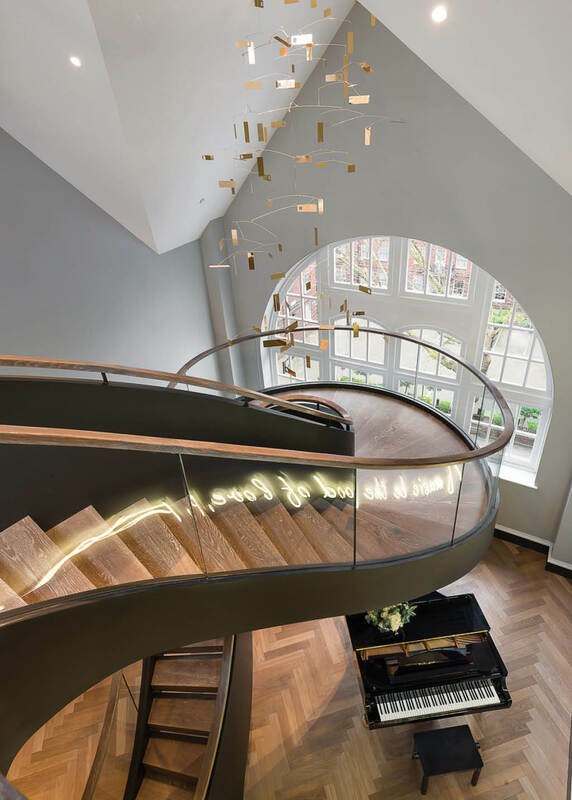 Using art, such as the gold pendant chandelier in the living space, maximises on the dramatic double height rooms and connects the property in an open plan, airy scheme. A glass roof floods the apartment with light and leads to five spacious roof terraces with London-wide views. 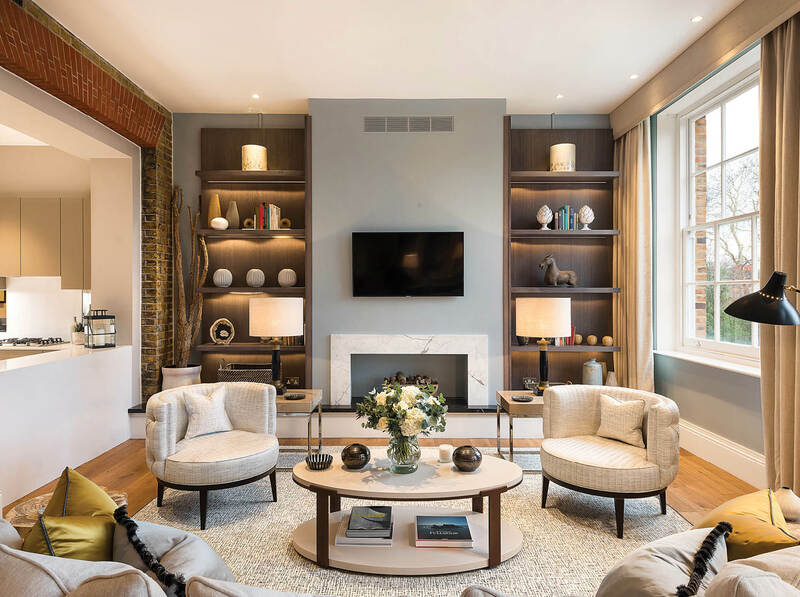 With a focus on areas for hosting any number of guests, Joanna has created spaces for large gatherings, such as the light filled hall with baby grand piano, and more intimate occasions, a perfectly proportioned home bar housed in an open plan is ideal for a party of five or six. SAVILLS AND KNIGHT FRANK AND THEIR CLIENTS HORTENSIA PROPERTY MANAGEMENT LLP GIVE NOTICE THAT: 1. They are not authorised to make or give any representations or warranties in relation to the property either here or elsewhere, either on their own behalf or on behalf of their client or otherwise. They assume no responsibility for any statement that may be made in these particulars. These particulars do not form part of any offer or contract and must not be relied upon as statements or representations of fact. 2. Any areas, measurements or distances are approximate. The text, images and plans are for guidance only and are not necessarily comprehensive. It should not be assumed that the property has all necessary planning, building regulation or other consents and Savills and Knight Frank have not tested any services, equipment or facilities. Purchasers must satisfy themselves by inspection or otherwise. 3. These particulars were prepared from preliminary plans and specifications before the completion of the properties. These particulars, together with any images that they contain, are intended only as a guide. They may have been changed during construction and final finishes could vary. Prospective purchasers should not rely on this information but must get their solicitor to check the plans and specification attached to their contract. 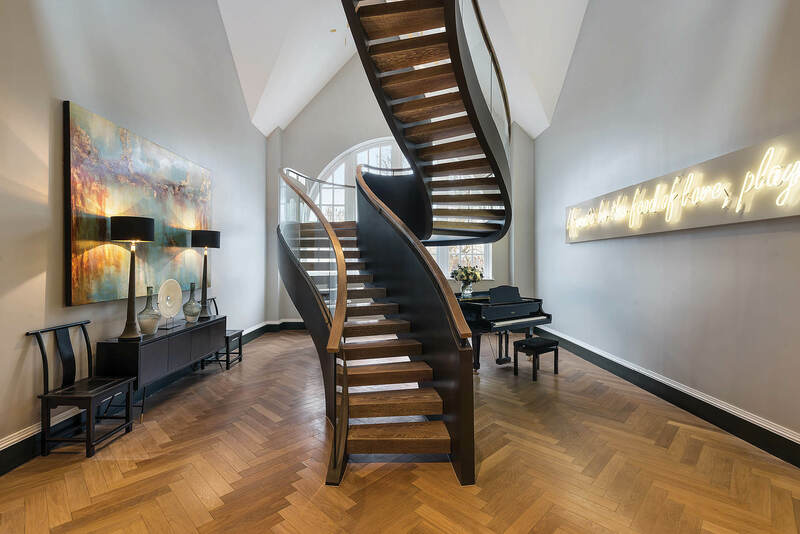 The Sloane Building Penthouse has a dedicated private entrance on the third floor, which offers access to a statement staircase spiraling upwards within a triple height space at the front of the building, illuminated by one of the large semi-circular windows of the former art studios. Spanning the entire fourth floor of the building, the Penthouse offers a unique rooftop escape at the heart of Chelsea. 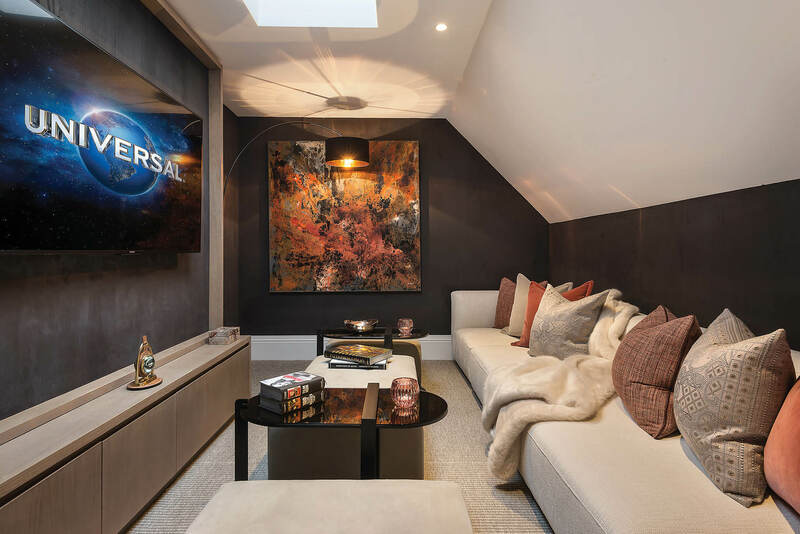 This dynamic residence features Five bedrooms and a choice of five roof terraces with views of The King’s Gardens. 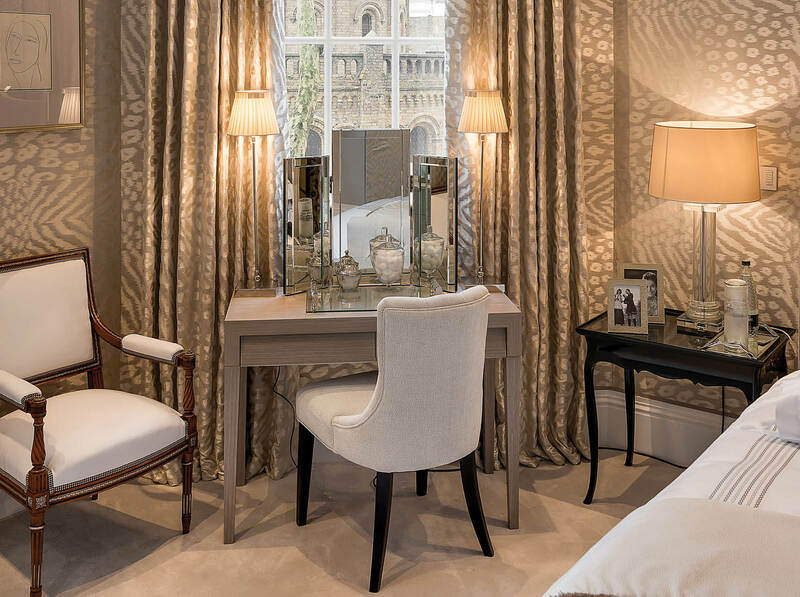 The second floor wrap around gallery provides access to three en suite bedrooms, while an impressive master bedroom suite complemented by a substantial dressing room and a separate study graces the other wing. Entertainment spaces and dining areas flow through the apartment. 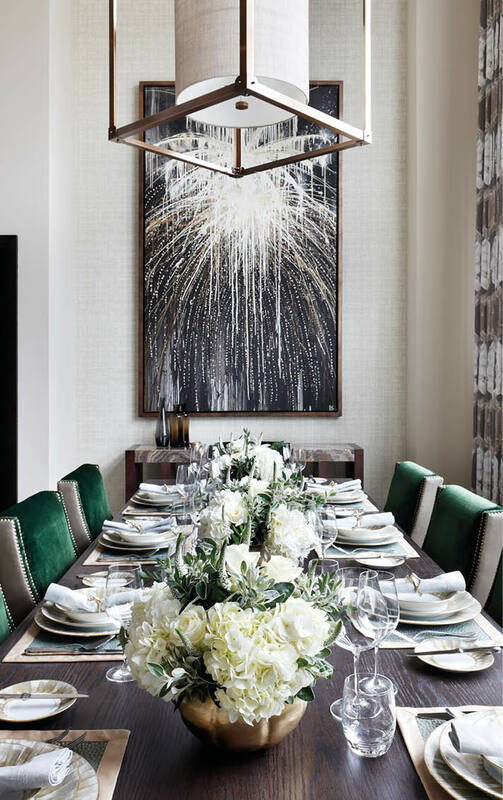 The Penthouse at the Sloane Building is a beautifully conceived with over 6,000 square feet of lateral living space. 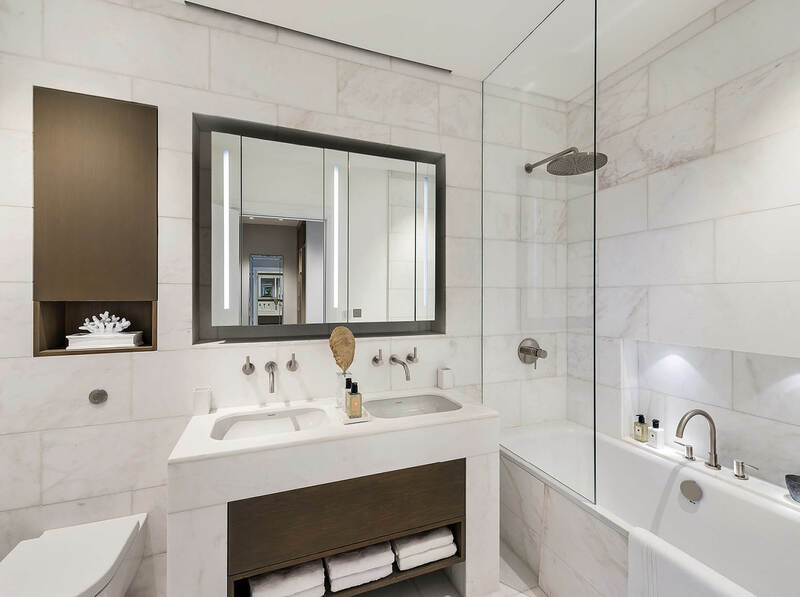 Apartment Nine, located in the heart of the building is one of the largest and most engaging residences at the Sloane building. 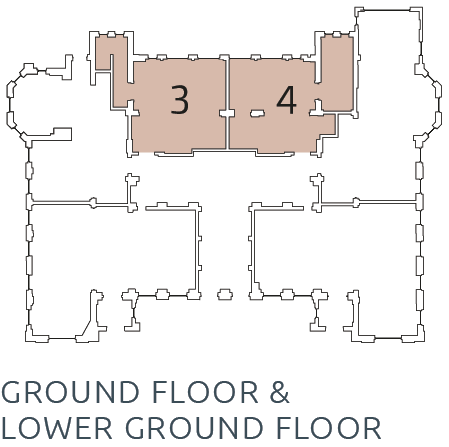 The four bedroomed apartment is arranged over the first and second floor levels. The Apartment focuses around a dramatic open plan living space that sits at its core and inhabits the double height school assembly hall. The Penthouse offers five substantial bedrooms with en suite bathrooms. The master suite sits within one of the former music rooms and is served by a double bathroom and a dressing room. A bespoke staircase wraps itself around the sides of the feature dining space, which hosts a cocktail terrace above providing a unique setting to enjoy both the luxury of space and views through the feature 7.5m high windows.